I consider Black Friday to be a day that I have been training for year round. This year, as per the last few years, the sales actually start on Thanksgiving…. Thursday November 26th. I love a good Disney deal when I see one! For the adults, I have compiled a list with lots of variety. There are a couple of items that, I suppose, could end up on a list for children as well but I like to think that we are all young at heart. 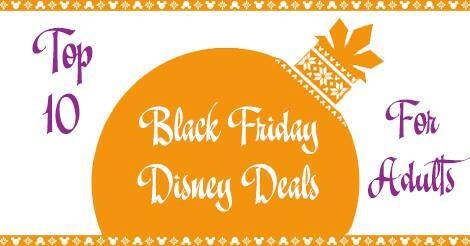 It’s time to treat your Disney side with my top 10 Black Friday Disney deals for adults! I will start with a bit of an aside because I think it’s quite note worthy. Many of the items on all 4 lists (the rest are yet to come) I am publishing are from Kohl’s. Kohl’s, aside from having some wicked awesome prices, also has a deal where you spend $50 and get back $15 in Kohl’s cash. This means that you already save money on the items you purchased but then you can go back later and save even more money again. This is a deal that every keen shopper hopes to find so I thought it worth mentioning. Now let’s go to the list! There it is… my top 10 items for adults. Remember, if you want to see the actual items in flyers, check out theblackfriday.com! I really think #4 and #7 could be my favorites. What are your faves? Will you be using my list to help plan your Black Friday shopping? Let me know in the comment box below! I’m a huge Disney fan. I will not though, support any of these retailers mentioned in this list And I urge you all to do the same. By offering these “Disney Deal” these retailers are forcing employees to leave their families on Thanksgiving Day or loose their Jobs. There is no Disney Deal out there that will be big enough To allow me to participate in such a selfish act. I urge you all to wait until Friday to look for the sale and as you all know there will be plenty of sales throughout the season. Let these sales people have dinner with their families. If we don’t shop on Thanksgiving day there would be no reason for the stores to open . We can all have thanksgiving dinner with our families. I’m sure Walt Disney would support that idea!